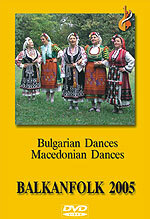 The DVD Balkanfolk 2005 - Balkan Folk Dances presents 28 folklore dances from Bulgaria and Macedonia. Dances from all ethnographical regions of Bulgaria are included. The dances which are included in the video tape are a part of the educational programme of Balkanfolk 2005 - an annual practical seminar for Balkan folklore.